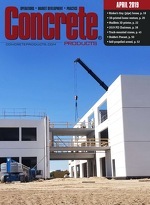 Concrete Products - Innovations Reports gives an in depth look into new technology for concrete producers. Concrete Products examines polypropylene, nylon, acrylic and other synthetic products for secondary concrete reinforcement, plus steel fibers, which continue to show potential for replacing conventional rebar or mesh. Most of the products and technologies here will be exhibited at 2018 World of Concrete. Leading into the premier North American Commercial Vehicle (NACV) show earlier this fall, Mack Trucks unveiled Granite and Pinnacle model cab improvements aimed at helping customers attract and retain drivers, and boost productivity. Fountain Place in Dallas is an architectural wonder known for its “dancing” water gardens at the base of a dramatically sculpted, reflective glass office tower designed by I.M. Pei. When the time came for the water features to be renovated, the building’s ownership group and primary engineer wanted the garden to be leak proof well beyond the level the original waterproofing materials afforded. The formulation of diesel fuel and its preferred method of combustion in diesel engines have undergone a number of significant changes in the past decade. These changes present a series of new challenges for fleet operators, such as those in the ready-mix concrete business, who must satisfy their demands if they are to keep fleets rolling and out of the maintenance bay. HawkeyePedershaab Concrete Technologies has machined successors to its Model 2100 and 2206 PipeMaster Unloaders. The new Model 3100 and 3206 PipeMasters can unload pipe as quickly as they can be rolled off the truck and be operated by truck drivers alone. Their smooth hydraulic action virtually eliminates breakage as pipe is securely cradled between the frame and fork during unloading, then gently lowered to the ground at a controlled rate.